I had the opportunity to stay at Villa Paloma in Phuket recently. Getting there was effortless and it was only a short 20-minute trip from the airport by car. This was an incredible villa that exceeded every expectation I had imagined. It has an absolutely rarified atmosphere. From the moment of walking in you are transported in space and time. I say space, because of the phenomenal architecture and design of the villa. You are immediately struck by the vaulted high ceiling the light and open air feeling that opens up to the garden so you feel you are in nature outside yet you are inside at the same moment. And I say time, because the entire villa is furnished with exceptional artwork and originals from Jane Mansfield’s Hollywood home. The attention to detail, the meticulous arrangement of photographs and vintage Hollywood posters creates an ambiance that transports you into that Hollywood era of time. This combined suspension in time and space is one of the most exotic experiences I have ever had. That afternoon, I had to shop for a bathing suit. I found shops and many delightful local restaurants to chose from for late lunch, were conveniently only a few minutes away by car. Later, I found checking email with the fiber optic Internet was blazingly fast. The villa is immaculately clean and very comfortable. In the evening there is a serenade of singing from the natural creatures of the tropics. Mark is a superb chef and is able to create an evening meal without any apparent effort that is an outstanding culinary experience. While your senses are still reeling from the resonance of the villa, the next morning Mark reveals more secrets. Next to the villa is a pitch, an enclosure with high quality grass, similar to a golf green, fixed with soccer goals on both ends. Add the soccer balls for practice, exercise and cardio. You also have an audience of figures created by an incredibly gifted graffiti artist, Cece Nobre, with a background of culture from the United States, Paraguay, and Brazil whom is now living in Thailand. The figures seem to touch a primal wisdom in the soul, as their eyes cheer you on darting around the pitch. Truly, these are magical moments. Of course to cool down, there is a saltwater pool without any chlorine smell, and the water leaves your skin rejuvenated. Villa Paloma is note worthy. It has a panache that demonstrates the “exceptional” in every aspect of its design and elegance for anyone looking for a special memorable getaway experience I recommend it. Mark is an incredibly warm and gracious host, I felt so welcome during every moment of my stay and I am most grateful for the experience. I'll be honest - this is not a beach-side villa, and there are not many attractions really close by. But you don't need them! 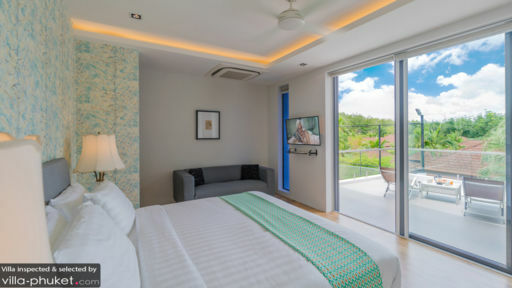 The owner, Mark, or the villa manager, Kate, can organise a rental car, or a car with driver, so you can visit any of the many attractions Phuket has to offer...... and then come home to this. After trips to a few beaches, if you are like me, you will be tempted to just stay here. Especially if you hire Mark to cook you a meal that will rival (and, in fact, surpass) the best that any restaurant can offer. I mean it - he is a first class chef.... you have to try his mini quiches and his Tiramisu; and he even turns a mundane roast chicken into an event. But back to the villa itself..... I really cannot fault it in anything. It's a secluded paradise in every way, inside and out. The housekeeper keeps it spotless, the pool is ever-inviting, the indoor/outdoor design works perfectly (with floor-to-ceiling and wall-to-wall state-of-the-art mosquito screens, as required), and exploring the Jayne Mansfield Collection, housed here, is a wonderful way to pass the time. And then, there is the football pitch!! What a unique idea and perfect complement to the villa..... even if you don't play football. I loved just walking, and exercising, barefoot on the beautifully kept grass, and my two sons played and practised their goal shots every day. But I must warn you: if you stay here once, you will want to come back. This villa has everything you would expect for a comfortable stay in any place in the word. It is very spacious and professionaly designed. Very functional - 4 bedrooms with individual bathrooms, plenty of space, good storage and big comfortable beds. Main area is big, airy with open plan layout, accesing the swimingpool, creating nice outdoor living experience. It is a salt water pool! - no chlorine smell! Swimingpool is good for kids (with safe depth on one side) and an atractive fountain/waterfall at its end. You have: aircondition, fans and nice lights allowing you to create an ambience of your choice in the evenings. Internet and TV box with netflix and all you need + nice soundsystem works well if you want to have a pool party with friends. Maid is coming daily, pool and garden maintanance is in place as well. 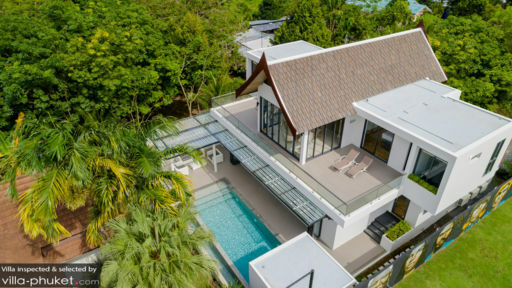 This villa is not the first development of it's owner and that is why there is no flaws to it - and this is an extra bonus in Thailand. If you need a car rental (and you will need it in Thailand) or any guidance, the owner can help you with everything as he knows Phuket like the back of his hand (lived there many years). Beautifull beaches, first class dining and night life is on offer in Phuket, even when at first glance you are in the middle of a jungle. Staying in the villa will give you an experience of a perfect escape - comfortable and luxurious accomododation in a quiet, hidden location. 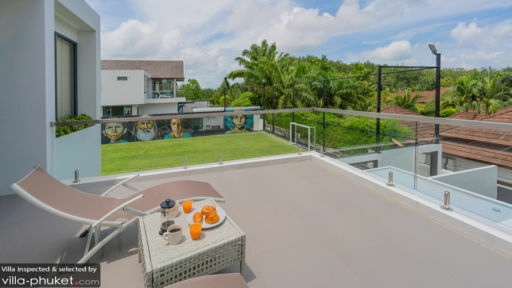 Next to villa Paloma stands its "twin brother" villa Pablo (with football memorabilia) - it can be rent together but if not, both of them are private enough. It looks exactly like on proffesional pictures!